"The Epic of Gilgamesh is an epic poem from ancient Mesopotamia. Dating from the Third Dynasty of Ur (circa 2100 BC), it is often regarded as the first great work of literature. . . . 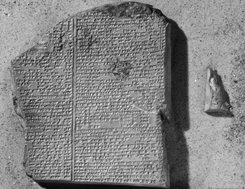 The first half of the story discusses Gilgamesh, king of Uruk, and Enkidu, a wild man created by the gods to stop Gilgamesh from oppressing the people of Uruk. After an initial fight, Gilgamesh and Enkidu become close friends. Together, they journey to the Cedar Mountain and defeat Humbaba, its monstrous guardian. Later they kill the Bull of Heaven, which the goddess Ishtar sends to punish Gilgamesh for spurning her advances. As a punishment for these actions, the gods sentence Enkidu to death. In the second half of the epic, distress about Enkidu's death causes Gilgamesh to undertake a long and perilous journey to discover the secret of eternal life. He eventually learns that "Life, which you look for, you will never find. For when the gods created man, they let death be his share, and life withheld in their own hands". However, because of his great building projects, his account of Siduri's advice, and what the immortal man Utnapishtim told him about the Great Flood. . . ."